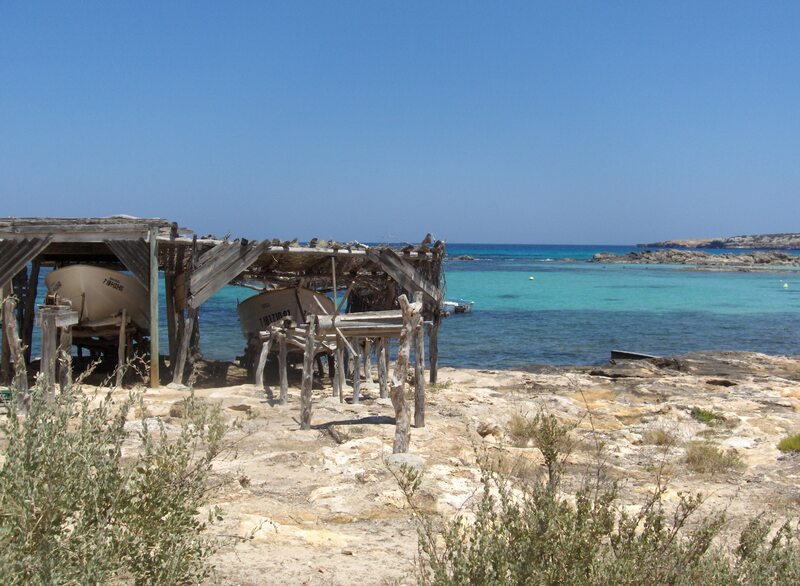 On the Origin of Species on Formentera: 2. The animal population. Lizards. 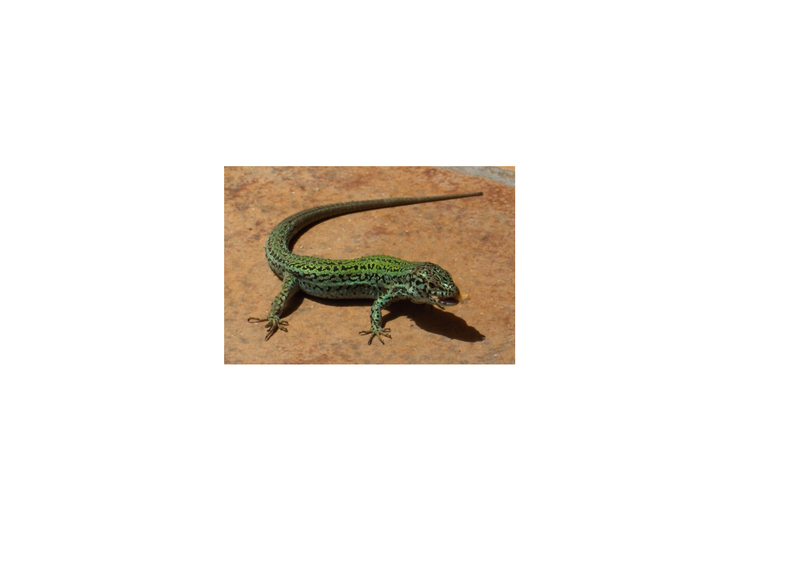 The rocky and dry island is home to an amazing number of very green male and a lot less green female lizards. Once you leave the beach or road and enter the forest you will hear them running away from you. However, if you keep still for a while, they will begin to see you as part of their surroundings and might even run over you. 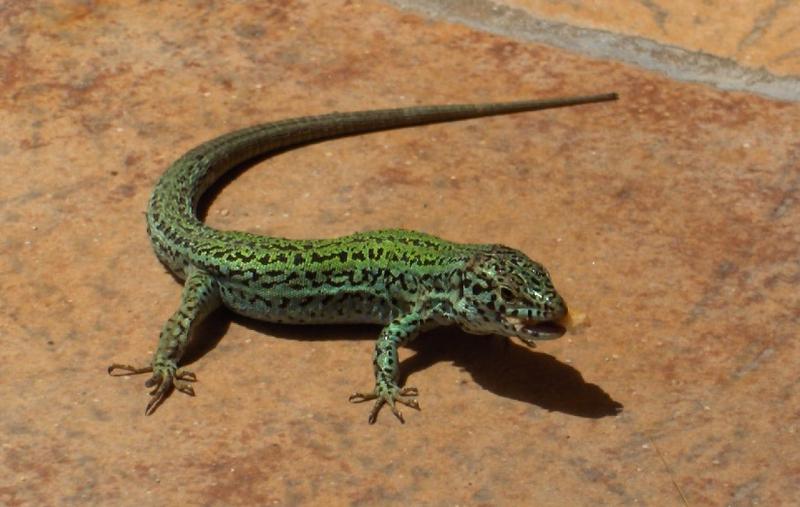 The lizards on the Balearic Islands are supposed to be a special kind with extra long toes and fingers. In the old days the ladies of the house apparently tamed one with some food and took pride in the fact that the lizard then dropped by every day to claim its ration. Sure enough, this still works. In fact, it works so well that with a few crumbs of magdalena (normal brand, I swear! ), three others show up as well, a fight is started, even more show up and the overwhelmed lizard whisperer then decides to finish breakfast inside the house. Centipedes and mosquitos. I assume no description is needed for any one of these animals, other than that both are available in copious amounts. The three aforementioned species have even developed an odd type of symbiosis, of which the purpose is not yet clear. You will find all three at night in an outdoor toilet for example: a centipede will start running between your feet, while you try to prevent a mosquito biting in your ankle and another one sucking blood from your buttocks. In between, you are staring in the eyes of an annoyed and stressed lizard, who has managed to fall in the sink and is not able to escape due to the slippery walls but still seems to be perfectly willing to attack you when it gets the chance. Staying in a house in the country is an excellent way to reconnect with Mother Nature again. On the Origin of Species on Formentera: 1. The human population. Darwin’s Beagle never moored off the coast of Balearic Island Formentera and perhaps that is all for the better or else the poor man would have felt obliged to write an extra book on his findings on that particular 19 kilometer long stretch of land. This is what I found over the course of just one week. Hippies. And lot’s of them. Many are original, having somehow managed to survive the sixties, seventies, eighties, nineties and zeros (yeah, that is longevity, man) and are still doing what they have always done: making music, driving painted VW mini-buses, growing hair, enjoying the free beer the audience is so kind to donate every once in a while and trying to sell their home made stuff to the slick Italian tourists (see next entry). 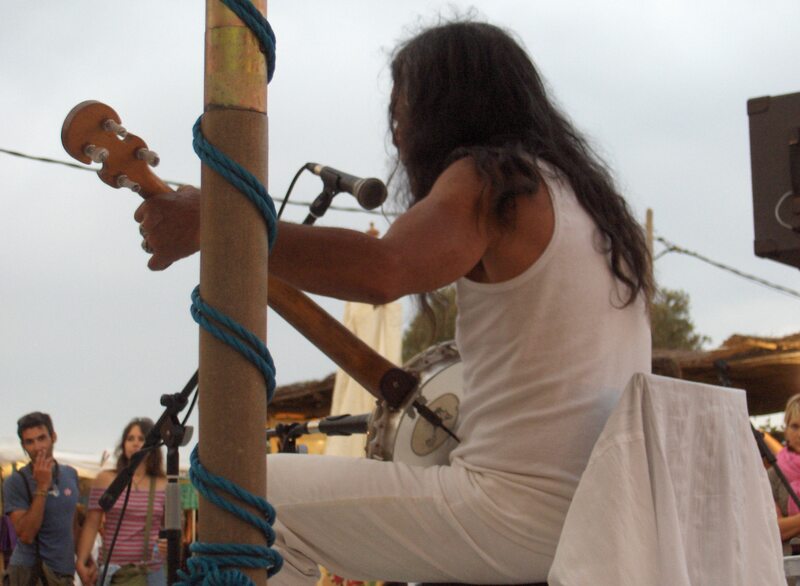 They are not in danger of extinction: many younger people are attracted by the eternal summer of love and are slowly adopting the habits and the hairdo. Expect to meet people who believe drinking your own morning urine is good for the skin, who think of the word ‘consumista’ if they really, really want to insult somebody and if you ever are invited by them to drop by for lunch or dinner, please do not expect to actually receive something to eat – it is the thought that counts, right? Slick Italian tourists. To be recognized by slick hair on the head and no further body hair at all for both females and males. Hairless legs, shiny arms, completely smooth chests and spotless private parts (beaches on Formentera have no dress codes and make for excellent observation). They tend to move around with their equally perfect partners, checking out completely hairless other couples and totally ignoring the other species that does seem to take pride in what is growing on their head (=eg. hippies) . Smiling is not allowed: the perfect face is easier maintained without the disrupting smile and accompanying skin cracks. A well positioned and mysterious looking tattoo is another sign of being part of this tribe, just as well as the right trainers, the right sunglasses and the right and seemingly effortless position on the rented motorcycle. The Italian skin only needs 1 hour and 25 minutes of beach to change from a pale color to the perfect shade of bronze. These two species manage to live completely separate lives, except for a few nights a week. 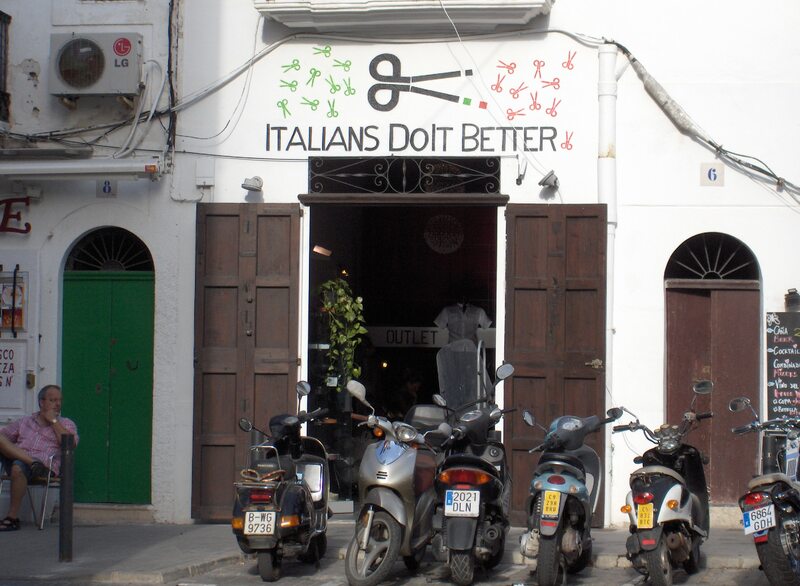 On those nights the hippies need the Italians to sell their home made jewelry to and gather enough funds to maintain their Arcadia and the Italians need the hippie markets to be able to stroll around –since not much active nightlife is available. Remember, that is what Ibiza was invented for- , show off their perfectness and buy the perfect souvenirs to bring home to their mothers. The confrontations are usually uneasy (“How much for that?” “40 Euros” “What?” “Yes, but is real mother-of-pearl” Italian walks away and mumbles “ The guy is out of his mind” and the hippie mutters “ This isn’t what it used to be”) but no real problems were observed during the week. However, the future remains unclear because every year more and more Italians make the journey to the island.